For those of you who have never been to a Chinese wedding, its elements are very traditional and laden with lots of symbolism. The feast is no exception. 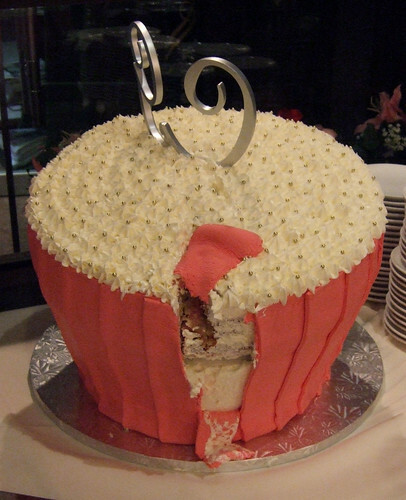 The wedding I attended served up a nine-course menu, not including dessert and cake. To say that we all rolled out stuffed would be an understatement. What I love about Chinese banquets is how well thought out they are. It’s not just food on the table to appease the hungry crowd, but each dish has some symbolic meaning to the newly wed couple. We Chinese just can’t stop philosophizing, even during meals! First course: Roasted whole sucking pig. 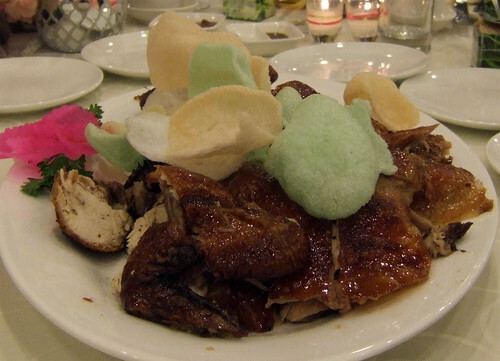 If you know anything about traditional Cantonese cuisine, we like things whole (re: chicken head). It not only signifies togetherness, but also prosperity (as back in the day, it would be very expensive to afford a whole carcass of anything). 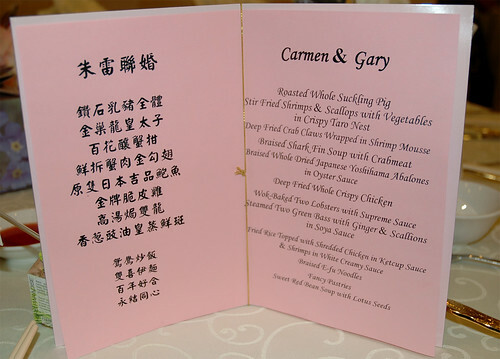 Serving suckling pig at the banquet symbolizes virginity and…well, we know where that leads to. 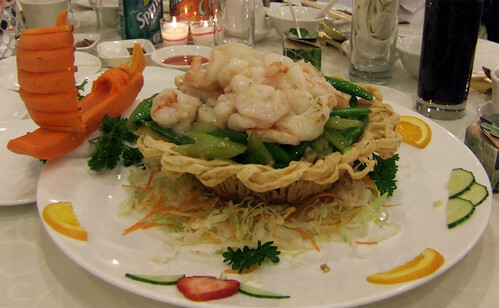 Second course: Stir-fried shrimps and scallops with vegetables in crispy noodle nest. Third course: Deep-fried crab claws wrapped in shrimp mousse. A popular item on any Chinese banquet menu. 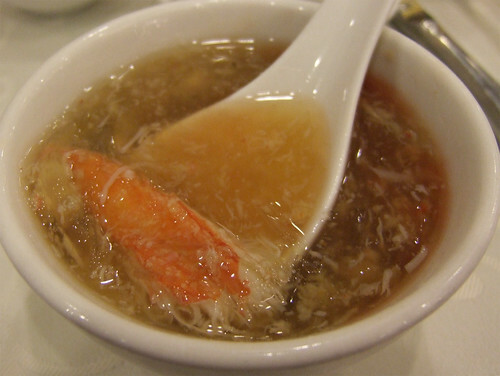 Fourth course: Braised shark fin soup with crabmeat. 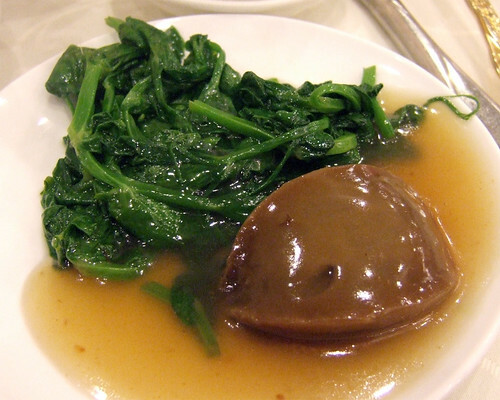 A controversial dish amongst Westerners, but it still remains a popular dish at any special occasion Chinese banquet. It symbolizes wealth and prosperity. Fifth course: Braised whole dried Japanese Yoshihama abalones in oyster sauce. 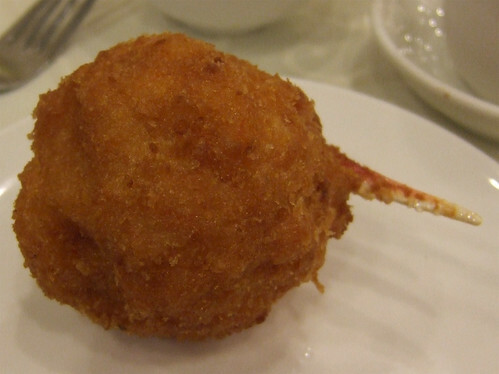 Another dish that symbolizes wealth and prosperity, it is also a play on words (another thing we Chinese love). The Chinese word for abalone (bao yu) sounds similar to “assurance of surplus (wealth)”, thus wishing the new couple prosperity in their new marriage. Sixth course: Deep-fried whole crispy chicken. Traditional Chinese ceremonies play on the ying and the yang coming together. This is represented by the female phoenix and the male dragon. Such symbolism is carried through to the banquet, where the chicken represents the phoenix, and is always served whole (with the head!). Seventh course: Wok-baked two lobsters with Supreme sauce. If the chicken represents the ying/female phoenix, then the lobster takes the place of the yang/male dragon. 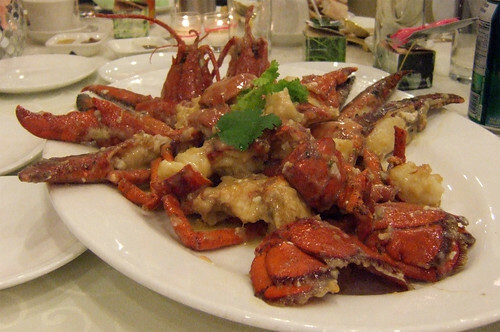 The red colour of the cooked lobster makes this dish especially auspicious, as red in the Chinese culture is a lucky colour (whereas white is used for death). Traditionally, seafood is served before the chicken, as it is customary to serve all the expensive foods first, but it seemed things were switched around on this menu. 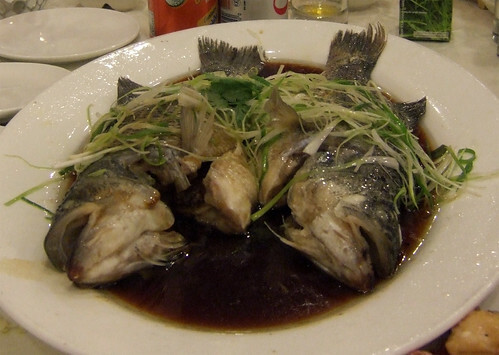 Eighth course: Steamed two green bass with ginger and scallions in soya sauce. 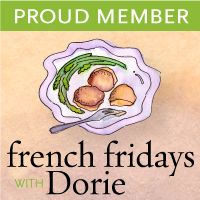 Much like abalone, the word of fish (yu) sounds like the word “abundance” or “surplus”. 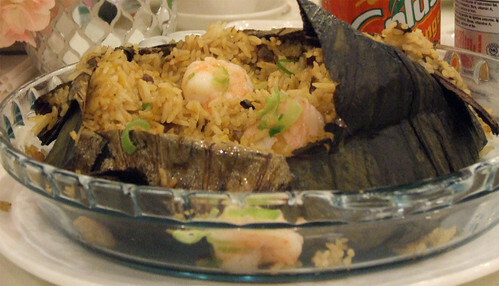 Ninth course: Fried rice wrapped in lotus leaf and Braised E-fu noodles. All Chinese banquet dinners end with fried rice and noodles. Of course, we can’t forget the desserts. Aside from the traditional red bean soup and wedding cake, guests were treated to a sweet table with cupcakes, fresh fruit, Chinese pastries and a chocolate fountain. It was a lovely reception indeed, and all my best wishes to the happy couple! The Food Junkie August 26, 2010 at 10:51 a.m.
Looks delicious! Chinese weddings are THE best haha =) I went to a wedding reception on Saturday as well ^_^ Had good abalone as well (the previous 4 weddings that I attended this year didn't serve abalone). I was stuffed.